(Johannesburg, 13 August 2013) Youth Citizens Action Programme, (YCAP) successfully launched by NPO Afrika Tikkun and now powered by new NPO Empowervate in partnership with Deutsche Bank Africa Foundation, The Department of Basic Education and Heartlines in 2010, is once again challenging Grade 10 learners to demonstrate what it means to be an empowered citizen, encouraging youth to be proactive and forward-thinking. The annual YCAP initiative has developed into an exciting and interactive competition involving a total of 1080 schools across South Africa in the four years of the competition. Participating schools in SA’s nine provinces are requested to identify a social challenge that adversely affects their school or community, and develop and implement a strategy to overcome it. 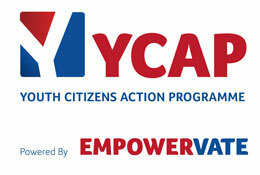 According to YCAP Founder and CEO, Amanda Blankfield-Koseff, typical challenges that the youth choose as topics include abuse, (substance abuse as well as emotional abuse, such as bullying and peer pressure), teen pregnancy, safety and security, environmental issues (such as litter problems and vandalism), knowledge and learning, morality and honesty. Participating learners are required to compile portfolios of evidence in their groups of up to ten learners per group, and then they have to nominate two of these learners to present their portfolio at the district level elimination round and then the provincial competitions to be held in each province from 16 August to 7 September. The first placed school from the provincial competition receives R5, 000, with the two runners up receiving consolation prizes. All the prize money is expected to be used for the expansion of their projects or improvement of school conditions. A Great Effort Award will also be presented to the school in each province that put in great time, effort and commitment to succeed in the competition, but were not resourced or supported enough to make it into the top 3. The first place winners will represent their province at the national championship event on 28 September in Cape Town where an esteemed panel of judges will decide on the overall winners. At the national competition, the qualifying teams will stand a chance to win the grand prize of R10, 000 towards expanding their empowerment project, as well as a trophy and a Certificate of Outstanding Performance for each of the participating learners. R7, 500 will be awarded to the learners in second place and R5, 000 to the team in third place. The Youth Citizens Action Programme is a successful initiative that was incubated at NPO, Afrika Tikkun in 2010, and was initially started as a pilot project in four provinces. The programme has since been rolled out to schools in all nine provinces across South Africa, targeting under-performing high schools in particular in order to uplift them. YCAP is powered by Empowervate and is a partnership between The Department of Basic Education and Heartlines and is sponsored by Deutsche Bank Africa Foundation.